“No more threats, no more fear, animal research wanted here”. On February 25th 2006 that chant, and many others, rang out across the city of Oxford. Around 1,000 students, scientists and patients marched through the streets both to demonstrate support for the building of a new animal research facility, and to protest against the animal rights extremism that plagued scientists in Oxford and beyond. “Rival protesters set for bitter clash over animal testing lab” – wrote the Times. Police lined the streets – with horses and riot vans – as did journalists from all over the world. The world’s first pro-animal-research-rally, and on the same day, in the same city, as a national animal rights demonstration. The city of Oxford held its breath in anticipation. For all of us organising the event – myself included – we had no idea what would happen. Animal rights extremism had been an intractable problem in the UK for decades, but the mid-1990s brought activists a string of successes. Campaigns in 1996 – 1997 shut down both Consort kennels and Hillgrove cat farm, which bred dogs and cats (respectively) for animal facilities. In 1999 the SHAC campaign began its 15-year campaign against HLS; the same year also marked the start of a campaign against Newchurch Guinea Pig Farm. Extremism continued unabated; in 2004 activists dug up and stole the remains of Gladys Hammond – a family member of the owners of the guinea pig farm. After petrol bombs and further threats the farm closed. The same year, the University of Cambridge abandoned plans to build a new primate research facility after intense pressure from activists including the activist group SPEAC (Stop Primate Experimentation at Cambridge). In 2004, shortly after Cambridge abandoned plans for its new lab, the University of Oxford laid out plans for a new animal research facility which would combine many of the smaller labs dotted around Oxford into one new facility with improved welfare for animals. SPEAC activists immediately moved to Oxford, renaming the group SPEAK. The extremism that had plagued Cambridge also moved to Oxford. In July 2004 construction on the new lab was halted for six months after the original building contractors – facing intense harassment from activists – pulled out of the project (as had many other firms connected to the building work). In the summer of 2005, with building work restarted, extremists from the Animal Liberation Front (ALF) targeted the students. 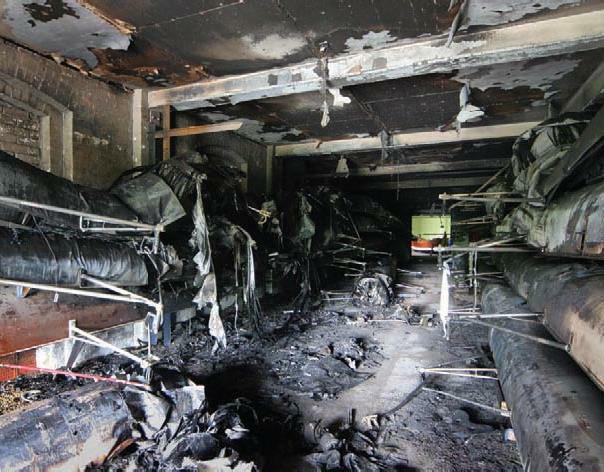 The arson attack on the University of Oxford college boathouses caused approximately £500,000 worth of damage. The targeting of student run, student owned boathouses mixed with threats against all university members shocked the student population. But it wasn’t the activists that would set the student population alight – it was a 16-year old school dropout – Laurie Pycroft. 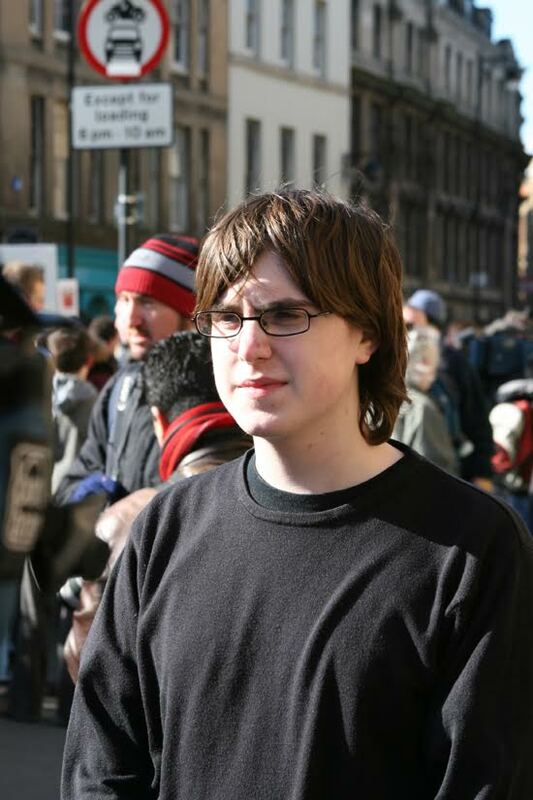 Laurie Pycroft walked through the streets of Oxford in January 2006. On his way, he came across an animal rights demonstration protesting the construction of the new animal lab. Laurie was bright, with a keen interest in science. He knew the only reason his grandfather was alive was because of surgery developed in animals. 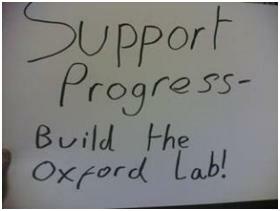 So Laurie went into a shop and bought a pen, and paper, writing “Support Progress – Build the Oxford Lab!”. He stood outside the demonstration holding his sign aloft. After receiving comments of support by passing members of the public, and screaming abuse by a number of activists, Laurie went home. From one anonymous commenter, the Pro-Test name was born. News of Laurie’s one man demonstration hit the student press and a number of students – including myself – got in touch with Laurie to offer him our support. In four crazy week we organised a demonstration that would be reported on almost every major news network in the UK. Despite the proximity of animal rights activists and Pro-Test-ers, the event when off without violence. Mild-mannered scientists shouted along to chants. Students raised hastily created placards above their heads. The mood was positive despite efforts from animal rights groups to force the climate of fear upon the rally. “How disgraceful that a 16-year-old boy has put the medical and scientific establishment, drug companies and universities to shame. Over the next two years the whole tenor of the debate changed – scientists became more willing to speak out – filling a vacuum that animal rights groups had filled with misinformation. In November 2008 the Oxford lab finally opened. Speaking of Research owes its existence to Pro-Test. As the original spokesman for Pro-Test, I spent six months in the US, supported by Americans for Medical Progress, whereupon I founded Speaking of Research. As an organisation we have supported subsequent Pro-Test movements all over the world. 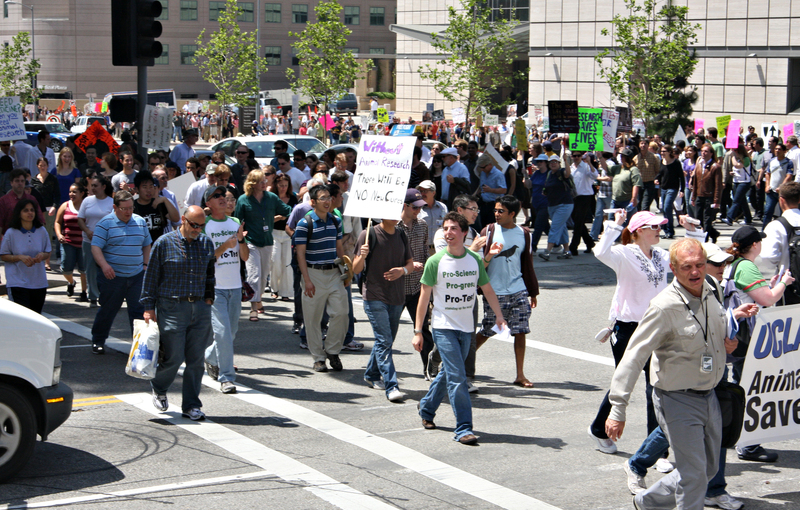 We supported the founding of Pro-Test for Science and helped it organise its first rally in Los Angeles after Prof Jentsch’s car was firebombed. We supported Pro-Test Italia in its first major rally in Milan. The successes of these rallies owed much to the actions of one sixteen year old boy. 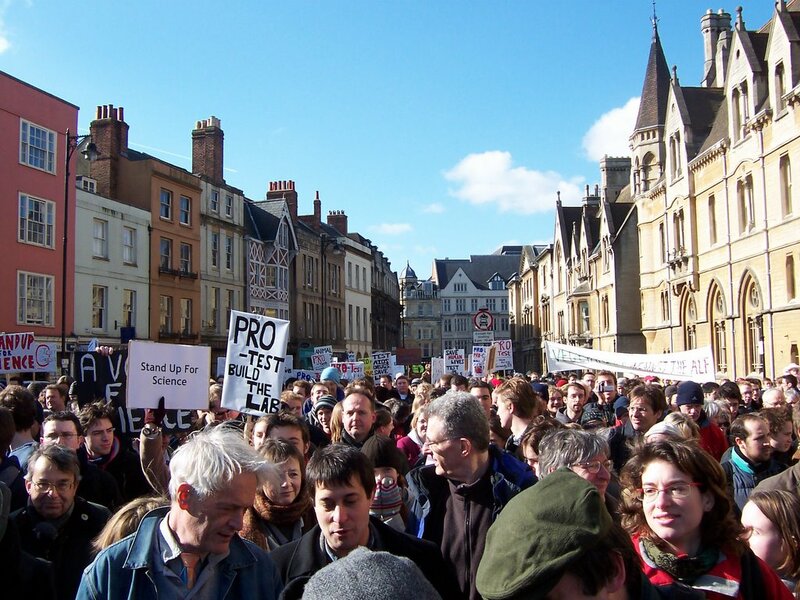 Pro-Test helped drive openness in the UK, and a fightback against extremism abroad. Every person who marched on the 25th February 2006 should be proud of the part they played. And Laurie? He followed his dream. Studies Physiology at the University of Oxford and is now studying for a DPhil in Functional Neurosurgery at the university – even (sometimes) working in the very lab he helped to build! Posted on February 25, 2016 February 25, 2016 by EditorPosted in Campus Activism, News, Outreach NewsTagged animal rights, Laurie Pycroft, oxford, pro-test, University of Oxford. Very interesting article. I was a strong ALF supporter in other areas but felt very uneasy about opposing medical research and despised tertiary targeting. I think Pro Test changed the debate – some of the people on the ALF side flat out scared me and it forced me to really reevaluate. I still think that some vivisection is flat out wrong but I totally understand where you are coming from – what happened to the Hammonds and to the Oxford boathouse was an absolute disgrace and pure thuggery.